I learned something from Come Dine with Me the other day (no, really). Apparently, Merseyside has one of the highest numbers of unmarried people in the UK. I know – what’s the marriage status of the North East got to do with a bunch of idiots terrorising other idiots in their own homes? To put into some context, this was Couples Come Dine…I’m assuming that’s why they chose to throw this fact in, rather than just some random Liverpool bashing from Channel 4. Bashing – now, there’s me and my defensive knee-jerk reaction to the subject of marriage, or rather not-marriage, rearing its ugly head. After years of social conditioning I now instinctively assume that when the subject is raised, it is usually done so negatively. Or confusedly, at least. As I find myself now, in a) my thirties b) a happy long-term relationship with The One (I apologise) and c) not married or wanting-to-be-married-ever-REALLY, I am finding it ever more the case. Why? It’s easier to assume I don’t know my own mind, rather than accept I choose not to marry. This seems to me to be a socially acceptable form of condescension. With all this in mind, the actual statistics really surprised me. The 2011 census revealed 51% of people have never married, or are divorced or widowed. Maybe I just knock around with old fogey traditionalists (I don’t), but my social experiences just don’t match this picture. Despite it being 2014, and despite being a ‘grown woman’ (of sorts), I still find myself embarking on conversations with total strangers where I feel the need to justify my decision not to get married. I can very much relate to those horrendous dinner party scenarios in Bridget Jones’s Diary. Women in particular just don’t get it, I’ve found. I get shot a look, like I’ve suddenly grown two heads and one of them is going to try and seduce their husband or something. Don’t get me wrong, this isn’t a big moan (ok, it is a bit). I can certainly understand why people want to get married. 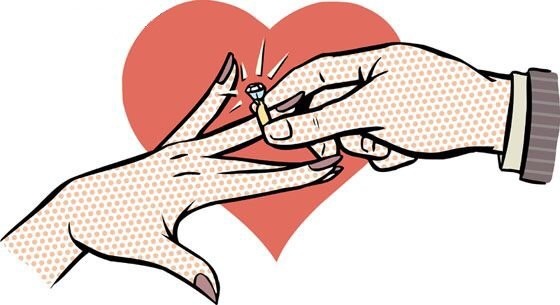 But I find it curious, the social taboos that still seem to operate in modern society, despite the very real facts of changing marriage trends. I wonder, is this just me? It wouldn’t be the first time. Or, does this strike a chord with other women? As a jolly aside, wasn’t it a whole lot better when Come Dine With Me was sponsored by Blossom Hill wine? Glorious sun drenched alfresco scenes, women frolicking around (clearly not talking about not-marriage) in pastels, a bit of Camera Obscura playing. To replace it with dishwasher tablets…why? Is this another comment on the recommended domestic lives of viewers? On that topic, get ready for my next post on the subject binge drinking. All the big hitters!